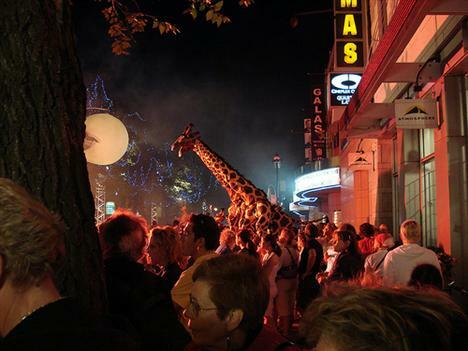 Photo: "Giraffes on St-Denis," by Midnight Poutine Flickr pooler Your new buddy. Paul McCartney tells Quebec nationalists to "smoke the pipes of peace" in response to criticism of his upcoming concert for the city's 400th anniversary. A group of sovereigntists called his presence overly "Canadianizing." Yes, a British man. A vital ovulation gene has been isolated by a team of Canadian and European researchers, news that could pave the way for new contraceptives and treatments for infertility. Research will now focus on whether eggs can be removed and fertilized from mice missing the gene. The City of Montreal is investing 1.5 million buckaroos in the revitalization of Rosemont Blvd. The area between Saint-Hubert and Chateaubriand will become a pedestrian zone. Other changes include a new park, a new library, and 600 new residential spaces. The overall crime rate for the Montreal metropolitan area has fallen by 14 percent compared to 2006. The change mirrors a Canadian trend in decreasing crime, which fell for the 3rd straight year in 2007. Now let's hope no hockey hooligans burn down more cars in the coming season. Electric cars are now allowed on some Quebec roads, thanks to a provincial pilot project. Drivers can operate in zones where the posted speed limit is 50 km/h or less and have to outfit their cars with an orange triangle that indicates a slower vehicle. Expect to see more interest in these things with the skyrocketing price of gas. We are talking about four (4) people. You call this a group? And aren't you gonna talk about the royal welcome QuÃƒÂ©bec gave to Sir McCartney? No of course.